Lap 27 already, Where are the stewards? still can't decide for penalty? If it is not Ferrari, it's no penalty. Bias FIA and stewards. i have put some pictures up n WEC thread just got some more to put up later. I think Ferrari still have the edge in tyre wear. Are mercs using their newest spec engine for this race ? Yeah. Sadly we are not just up against the Mercs, but the FIA and their bias towards our rivals - Merc and RB. How easy do you thing the Force Indias will make it for the Potato? Pff, Rai or Vet would have been handed a race ban by the finish of the second lap. Crazy the bias. We have to beat them on track! Ridiculous to retire a perfectly good working car, all thanks to stupid rules and regulations. Perez will eat em all freakin day in FP, QUALI and the race. Ferrari lost valuable CWC point in not getting KR to the finish... This has to be undone in Monza by 1-2! 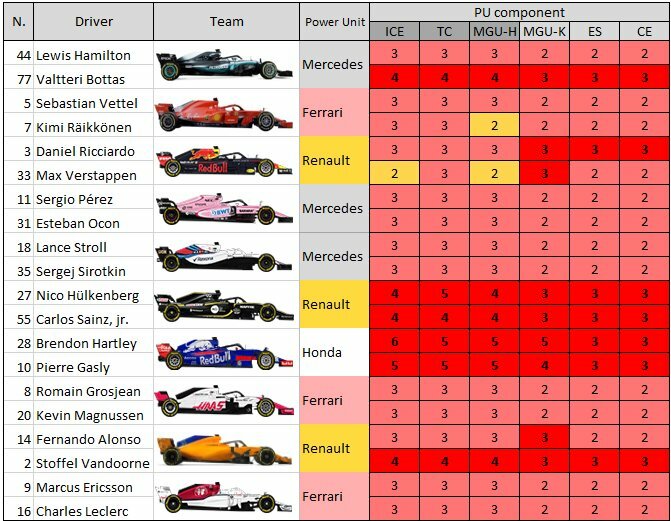 what is our engine/penalty situation? So Mercedes are still suffering from blisters. Their Merc-spec Pirelli tires are no longer in play for the rest of the season. Good for us! However, I am concerned that starting next year, Pirelli will bring the custom made tires in all the races next year and giving Mercedes yet another advantage, the way they did back in 2013 after their secret tire testing for 2014 spec tires. Hopefully we have a say in this matter. can we get to the end of the season with this? whats it like compared to merc? We won with those tyres, they were really not much of an issue other than us messing up in Spain. They are using new rims to induce heat into the tires....wrong move maybe??? ?